Later this morning, Jeff and I will be leaving the greater D.C. area and going to Tennessee. Because that’s where Bonnaroo is. This means I’ll have no Web access — no blogging, no photo updates, no Twitter — until Monday evening, by which point we’ll have returned to Silver Spring, running water, electrical outlets and that great vast thing called the Internet. I’ll have a full report of the festival by mid-week next week (but don’t hold me to that deadline), as well as photos (don’t hold me to that deadline, either). I briefly toyed with the idea of lugging my digital equipment and some audio gear so I could create an audio slideshow or some other multimedia project out of this four-day music festival… but nixed the idea, mostly because I’d have no way to keep that expensive equipment secure except in a very hot car. So I’m just shooting film instead. I need to finish up a roll of Fuji Superia 100, and then I can start on some Ilford FB4 125 Plus and Fuji Superia Reala (ASA 100). ON SATURDAY, Jeff and I went to Brookside Gardens in Wheaton Regional Park. 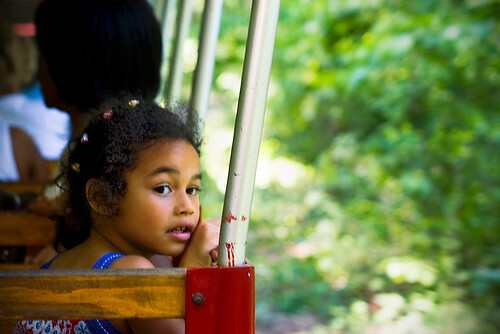 Among other things, they have a butterfly garden/greenhouse, a huge playground and a train. I just took my 50mm lens with me. It was a good choice. 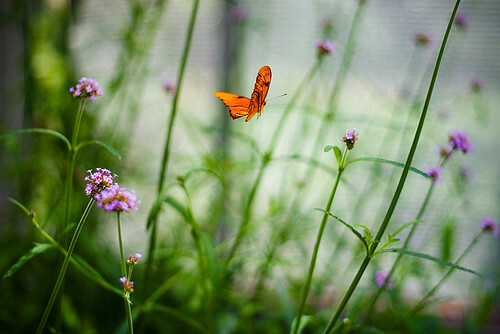 These butterflies were the prize to catch on camera. 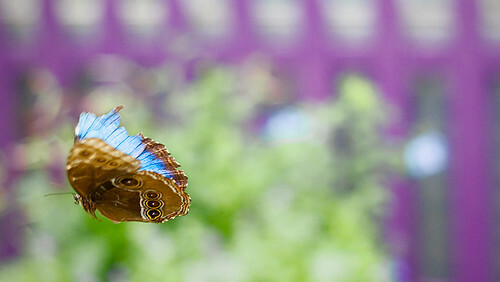 For one thing, they're amazingly beautiful because the upper side of their wings is a wonderfully iridescent blue. For another, their flight path is completely unpredictable (unlike that of the other butterflies in the greenhouse), so actually getting them in a frame was a huge challenge. This photo was pure luck. Jeff and I also rode the miniature train, which Jeff hadn't been on in probably 10 years. As always, you can view more photos by clicking HERE. TODAY, I went on my first actual photo assignment for my washingtonpost.com internship! Or, I shadowed and ended up being very necessary when Megan and I discovered that a tripod mount screw wasn’t the correct size. Once the work we produced is completed and published, I will disclose the full story. Needless to say, we returned to the office just before a big fat storm let loose over the greater D.C. area. Steve — another full-time photo editor — and Megan handed me a camera and told me to take a weather photo. At first, I went out on the balcony, with the intent of getting a wide cityscape shot and then hopefully capturing some lightning on a few frames. Then I was going to go street-level. But the full-time staff were concerned about liability should lightning strike, so I had to stay indoors. Which is why my first photo published on washingtonpost.com was taken from inside a window and looks almost like a cell phone photo. 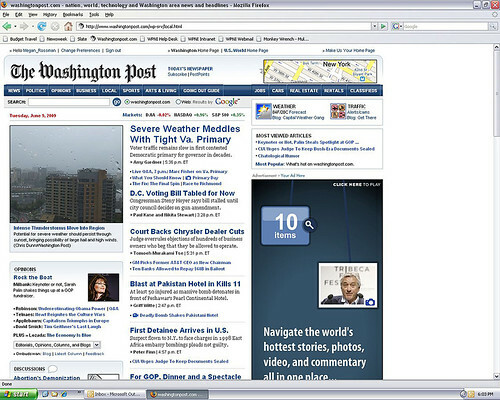 Click on the image to go to a larger view of this screen capture of my first photo published on washingtonpost.com! You won’t be hearing from me until Monday or Tuesday. Let’s just hope I survive the heat, humidity and intensity that is Bonnaroo.